Manufacturers in the golf industry are always trying to improve their products. And even some of those that most customers think are perfect also get regular updates so as to keep up with the intense competition. The Sun Mountain Three 5 Stand/Carry Bag is extremely popular, and it features a wider top that is flared to make club retrievals easier and faster than in other bags. Manufacturers in the golf industry are always trying to improve their products. And even some of those that most customers think are perfect also get regular updates so as to keep up with the intense competition. The Three 5 Stand/Carry Bag is extremely popular, and it features a wider top that is flared to make club retrievals easier and faster than in other bags. It also has a new score card pocket and other six pockets to make a total of seven with 5 of them having zippers. This bag comes in a variety of colors and a new body styling. The body has a more durable material when compared to the other Sun Mountain golf bags. Pockets and Storage: It has enough storage space for a standard golf bag. In total, it has seven pockets that include a beverage pouch, score card pocket, full-length clothing pocket and a velour-lined one for valuables. Cart Friendly Features: These features include a cart-friendly bottom section and the leg-lock system. Non –Slip Foot Pads: The triangular pads not only resists sinking into the grass but also sliding on wet surfaces and hence making it possible to use the bag in any weather. Wide Top: Three 5 Stand/Carry Bag has a nine inches wide and four-way top that will help you organize your clubs fast and efficiently. It also has an integrated handle that makes it easy for you to pick the bag. Rain Hood: A rain hood may look like a minor thing, but it is vital as it helps to protect your gear during severe weather. This bag comes with a matching rain hood to ensure that you can keep everything in the bag safe under any weather. Straps: The straps on this bag have four adjustment points, and the padding on the straps is also sufficient and comfortable on your shoulders. Has a very sturdy design and hence making it very durable. This bag makes a good investment as it will not only help you carry everything you need but will also last for many years. Just like the other golf bags from Sun Mountain, it is very light, and so the only weight that you will have to worry about is that of your gear since it does not add any significant weight to you. It is a very cool bag with some nice prints, and so it will help you maintains stylish appearance when on the green. There are more than ten colors to choose from and so you are free to choose what is mot appealing to you. Some customers complain of trouble with the straps. But, most of these complaints are because they are yet to figure out how to use them efficiently. However, this should not be an issue once you get used to the bag. Sometimes the legs may not pop out as far as you would wish and so it is necessary to use your foot to give them a nudge so that they can extend fully. Sun Mountain almost never disappoints when it comes to the manufacture of golf bags and they are always improving their products to make things easier for the average golfer. 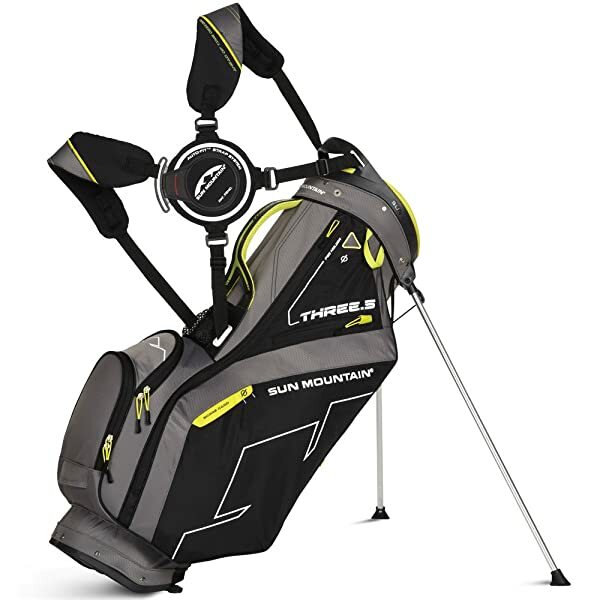 The Sun Mountain Three 5 Stand/Carry bag keeps up with this reputation, and you will not regret buying one. It has more than enough storage space for all your clubs and the other typical things you may wish to carry to the green. Apart from this is also one of the best golf bags and has no significant flow or disadvantages. And so with all things considered and weighing between its pros and cons this bag is worth trying out.